What's most interesting for you? The Buddhist Traditions of Russia: Commemorating the 250th Anniversary of the Lineage of the Pandita Khambo Lamas [Учение Будды в России: 250 лет институту Пандито Хамбо-лам]. Editorial Board: Prof. Dr. I. F. Popova (chief editor); B. B. Badmaev; Prof. Dr. V. L. Uspensky; Dr. A. V. Zorin (executive editor); A. A. Sizova (secretary). St. Petersburg: St. Petersburg Centre for Oriental Studies Publishers, 2015. 186 р. The book is based on the proceedings of the conference entitled, On the Occasion of the 250th Anniversary of the Creation of the Institution of the Pandito Khambo Lamas in Russia, held at the Institute of Oriental Manuscripts, RAS, and Datsan Kunzechoinei, on September 15—18, 2014. The conference brought together representatives of various academic, religious and cultural institutions of Russia, Mongolia and Poland. The collected papers of this conference will be of use and interest for scholars in Oriental and religious studies, as well as for all those interested in the history of Buddhism in Russia. In the article the role of Buddhism for the Buryat identity is studied. Though the Buryats who remained on the Russian side after conclusion of the Treaty of Kiakhta in 1727 were mostly Shamanists, a few decades later Buddhism became widely spread among them. The reason behind it lies in the strong Buryat aspiration to maintain their Mongolian identity. Since the majority of the Mongols who lived in the Qing Empire confessed Buddhism, the Buryats followed their example only to be identified as real Mongols. Some of the Buryats kept loyalty to Russia until it started a restrictive policy towards Buddhism, the main instrument of Buryat immunity against the cultural assimilation. Key words: Buddhism in Buryatia, identity, Mongols. The paper analyzes the influence exerted by Buddhism on the modern system of beliefs of the Tunka Buryats in which the cult of mountains and their sacral patrons plays one of the most important roles. Key words: Tunka valley, Buddhism in Buryatia, modern Buryat Shamanism, cult of mountains. The article introduces traditional Tibetan medicine as a comprehensive medical system which was elaborated in Tibet in the 12th century. The authors make a short observation of its sources, theoretical basis, unique methods of diagnosis and treatment, peculiarities of its pharmacy. It also contains a brief survey of the history of traditional Tibetan medicine in Russia, information about its famous doctors and main treatises. The authors also outline their own views of the advantages and perspectives of Tibetan medicine. Key words: Tibetan medicine, doṣa, Rgyud bzhi, pulse diagnosis. The authors of the article consider ten Buddhist paintings (thangka) made by the old masters from the 18th to 19th century. They are a part of the collection of the St. Petersburg Datsan and represent images of various Buddhas, Bodhisattvas and Dharmapālas. The first part of the paper deals with some issues of the conservation treatment applied in several stages to these thangka paintings. The second part focuses on the iconography and stylistics of the deities. Buryat, Mongolian and Chinese painting styles can be recognized. Problems of conservation are very important for Buddhist paintings. Key words: St. Petersburg Datsan collection of arts, Buddhist paintings, thangka, conservation, Buddhas, bodhisattvas, Dharmapālas. In this article, the author considers the origin, evolution and distribution of the cult of Vajrapāṇi. Originally, the cult of the ancient Greek hero Hercules influenced his iconography. Then he transformed into a wrathful deity of the Dharmapāla class. In Tibetan Buddhism Vajrapāṇi also appears as a Bodhisattva. However, his iconography as a wrathful deity is more widespread. Key words: Buddhism, Hercules, Vajrapāṇi, iconography, Bodhisattva, Dharmapāla. The article is concerned with the activities of Shun Dao (4th cent. AD), the first Buddhist preacher in the state of Goguryo. His activities are described in the three main sources on the early history of Korea: History of the Three Kingdoms (1145), Lives of Eminent Korean Monks (ca. 1215—1220) and Memorabilia of the Three Kingdoms (1285). A comparative study of the corresponding parts of these three sources makes possible to better understand the circumstances of the introduction of the Buddha’s Law into Goguryo — an important moment in the early history of traditional Buddhism in the present-day territory of Russia. Key words: history of Buddhism in Russia, history of Buddhism in Korea, Goguryo, Shun-tao, History of the Three Kingdoms, Lives of Eminent Korean Monks, Memorabilia of the Three Kingdoms. The author of the article proves to be erroneous a common established view that the first Tibetan texts were brought to St. Petersburg from Ablaikit Monastery in 1720. The evidence provided by the eighteenth century eyewitness reports discloses the fact that the very first texts were acquired from the so-called Sem Palat (Seven Chambers), another Dzungar ecclesiastical complex located on the shores of the River Irtysh, in 1718 (or 1717). The first Ablaikit texts were sent to St. Petersburg in 1721. However, it required some time for scholars in St. Petersburg and Western Europe to understand the fact that another ruined monastery had been discovered. On the contrary, in the second half of the 18th century the first acquisition of texts from Sem Palat was forgotten. The manuscript leaves from both sources were kept at the St. Petersburg Academy of Sciences for many years, then, in the 20th century, after the World War II, they were disseminated amidst numerous scattered materials of the Tibetan Library of the Institute of Oriental Studies, the USSR Academy of Sciences (now the Institute of Oriental Manuscripts, the Russian Academy of Sciences) until their rediscovery and identification in 2012—2015. Key words: Sem Palat, Ablaikit, Tibetan manuscripts, Tibetan Buddhist Canon. The article evaluates scientific and organizational contribution of S. F. Oldenburg and Th. I. Stcherbatsky to the organization of expeditions to Tibet initiated by the Russian Geographic Society and the Russian Committee for the Study of Central and Eastern Asia. Materials relating the expeditions of G. Tsybikov and B. Baradiin were used to demonstrate how the theoretical approaches of the St. Petersburg School of the Buddhist Studies influenced their aims and achievements. Key words: Russian Geographic Society (RGS), Russian Committee for Central and Eastern Asia explorations (RCCAE), Buddhist monasteries, A. M. Pozdneev, G. Tsybikov, B. Baradiin. The article contains the Russian translation of the 13th Dalai Lama’s alleged letter to the Tibetan people which is kept at the Archives of the Orientalists, the Institute of Oriental Manuscripts, the Russian Academy of Sciences, within the papers which belonged to Dmitry A. Klements. The document reflects the historical situation in Tibet in early 20th century and can be interesting to the scholars who study this period. Key words: the 13th Dalai Lama, the Tibetan government, reforms. The article introduces a collection of photographs depicting Russian merchants in Mongolia at the turn of the 20th century, and which are kept at present in the Museum of Anthropology and Ethnography (Kunstkamera), RAS. Key words: Mongolia, Russian trade in Mongolia, history of photography. In the article a modern interpretation of Buddhism by B. D. Dandaron (1914—1974) called by himself the Neo-Buddhism (необуддизм) is reviewed. Its teaching is an attempt to merge spiritual accomplishments of both the East and the West. The main points of Neo-Buddhism were first outlined by B. D. Dandaron in his letters to N. Y. Kovrigina in the 1950s. They contained his ideas of saṃsāra and nirvāṇa, the individual self, epistemology, ways of spiritual selfimprovement, etc. In order to clarify them for the modern Russian reader Dandaron also made use of western philosophical and scientific ideas. Key words: Neo-Buddhism, saṃsāra,nirvāṇa, mysticism, intuition, metaphysics, individual self, the synthesis of religion and science. The present paper is dedicated to the memory of Tenzin Khetsün (Fiodor Sergeyevich) Samayev (1954—2005), who was a wellknown religious leader, as well as an influential state and public figure of the 1990s. An educated Buddhist monk, who studied in Mongolia and India, Lama Samayev devoted his entire life to the revival of Buddhism in Russia. During the crucial years of political and social changes, he headed Küntsechoinei Datsan in St. Petersburg and restored it as a religious, educational and cultural center. One of the most significant aspects of his work was the endeavor to save the nature and sacred landscape in his native Oka and Tunka Regions in the Republic of Buryatia. The authors cite here a few previously published memoirs about Tenzin Khetsün Samayev and present some new ones. 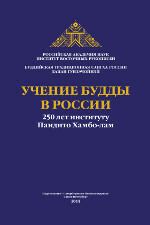 Key words: Tenzin Khetsün Samayev, Buddhism in Russia, Küntsechoinei Datsan in St. Petersburg, Oka and Tunka Regions of the Republic of Buryatia. The article informs about the events which were held at the State Museum of History of Religion in St. Petersburg to mark the 250th anniversary of the establishment in Russia the official rank of Pandita Khambo Lama who has been in charge of all Buddhists residing in Eastern Siberia. This exhibition brought to view many hitherto unpublished documents and photos. Some materials deal with antireligious policy exercised in Soviet times and the activities of Soviet museums aimed at preservation from destruction of Buddhist sacred objects. Key words: exhibition, Buddhism, Pandita Khambo Lamas, Buryatia, destruction of cult objects, museums, documents, photos. On April 2, 2018, at the meeting of the Council of Young Scholars at the IOM RAS, M.V. Fionin will read a lecture What is a Byzantine Lectionary Manuscript.